Children learn and grow from every space they encounter. Our classrooms are carefully curated to be homelike, inviting, and responsive to children’s continual development. 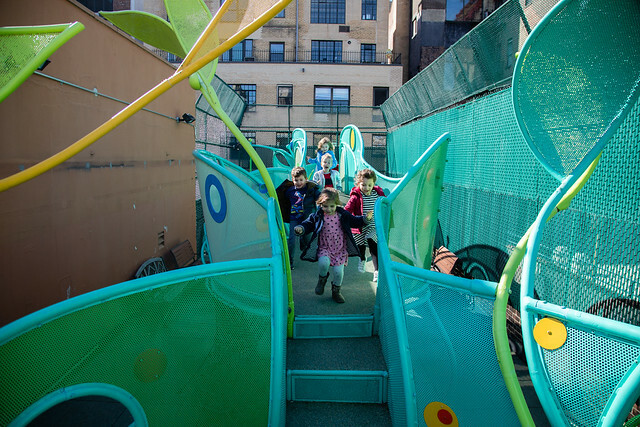 The ECC boasts a state-of-the-art rooftop playground and water play area and a whimsical indoor playroom created through a collaboration of our expert staff, parents, and leading design firm May + Watkins, which has built immersive multi-sensory environments for children's museums across the city. The inspired structures speak to children’s imagination and innate playfulness, and accommodate their different physical needs and developmental stages. Our light-filled art studio is the beating heart of our school, where creativity runs free. The studio looks out on the terrace, which has a playground specifically designed and sized with age-appropriate climbing equipment for our youngest students, and gardening space for children to interact with nature and science. We are licensed by the NYC Department of Health, which makes regular visits to ensure the high quality of our facility. Safety is a top priority of our community; professional security guards are on the lobby level at all times, and we have security cameras throughout the building.